The tax burden refers to the share of GDP that is collected in different forms of tax within an economy. For example, in an economy with a size of £1,000bn – if the government collects tax of £300bn, then the tax burden will be 30%. The tax burden gives a strong guide to the extent of government intervention in the economy. 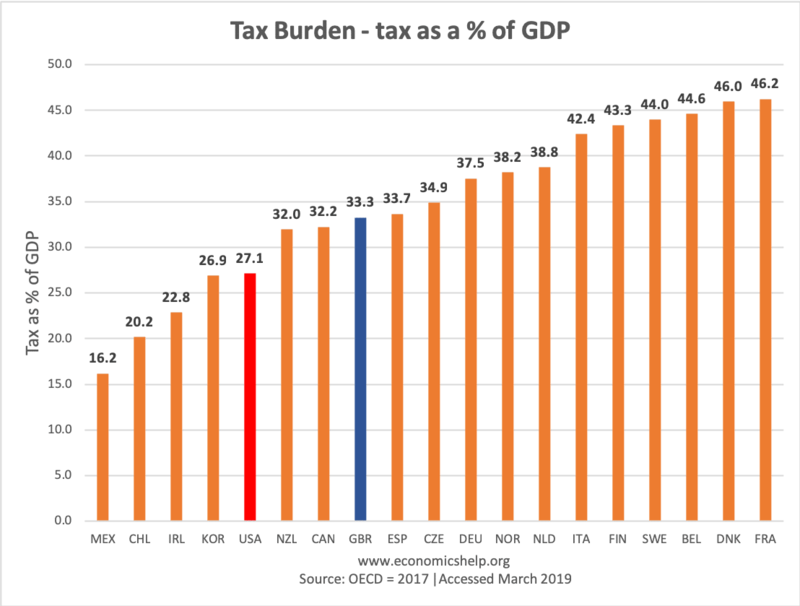 A high tax burden means an economy will have relatively higher levels of government spending – usually on health care, education, defence and social security spending. The term ‘tax burden’ implies the higher it is problem, reducing economic welfare. Free market economists tend to argue a higher tax burden can lead to a fall in economic welfare for the following reasons. Disincentive effects. Higher income tax can reduce the incentive to work. Higher corporation tax can discourage firms from investing – both these lead to lower economic growth in the long-term. Inefficiency of the public sector. In the public sector, government agencies and departments do not have the same profit motive of private enterprise, therefore, government spending can be more prone to inefficiency due to lack of motivation and accountability. Political pressures of maintaining spending. Once the public are used to certain types of spending, it creates powerful political pressure groups which seek to keep it – even if inefficient. For example, agricultural subsidies in the US and Europe are an inefficient way of supporting rural communities, but it has been hard to remove the subsidies. Less choice on how to spend. A higher tax burden means households and firms have less disposable income and less choice how to spend. For example, in the US, health care is mostly private – which gives individuals the opportunity to choose their healthcare. A generous welfare state can encourage disincentives to work. It is argued the generous welfare states of western Europe can contribute towards higher structural unemployment. With more generous benefits, there is a greater incentive to delay taking a job. Dissatisfaction – Some may point to recent protests in France as a signal that a higher tax burden can create dissatisfaction amongst taxpayers. Tax avoidance – a higher tax burden can encourage firms and individuals to shift profit and income to tax havens – and so the economy loses out. Public Goods. Except in rare cases, the free market does not provide public goods, such as defence, law and order and infrastructure spending. It is more efficient for the government to pay for these goods and services directly out of taxation. A good infrastructure can help reduce costs and increase the efficiency of trade and business and complement a working free market economy. The profit motive doesn’t apply to public services. For public services like health and education, the profit motive is less powerful. Doctors, nurses and teachers don’t need a profit motive to provide good care. There is a desire to offer a good service even in public sector where the state pays for health care. A profit motivated health care can also lead to higher prices for consumers. In the US with private health insurance, there are more administration costs due to wrangling between hospitals and insurers. Drug companies charge higher prices for drugs and expensive treatment. Opportunity cost. The US has a lower tax burden, but the US also has the highest ‘health care burden’ with 15% of GDP going on health care spending. Whilst the US has lower taxes, the opportunity cost is that firms, employers and individuals have to pay for private health insurance. It reduces discretionary income – only it is a different method, but some go uninsured. Low tax burden may suggest government struggles to collect taxes. Mexico has the lowest tax burden but has serious problems relating to crime, tax enforcement and low living standards. Link between living standards and tax burden? 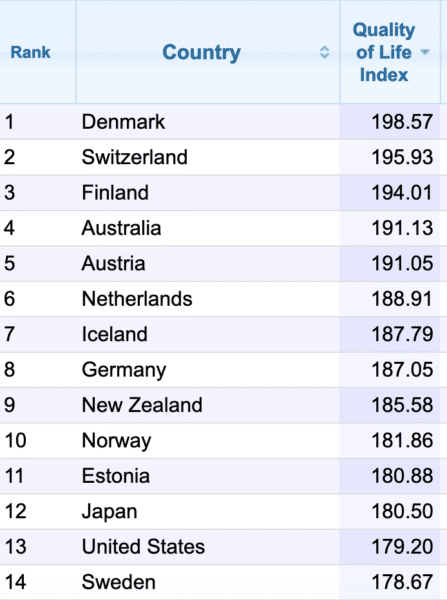 Countries in western Europe with the highest tax burden – often report highest levels of satisfaction. Welfare state and universal coverage give security. In the US an estimated half a million people a year declare bankruptcy due to medical bills (CNBC). Universal health care and social security give greater security and can encourage individuals to take more risks in setting up business because they don’t have to plan for ill health. Around this part of the globe higher and more taxing means more looting more corruption and more lack of value for resources.